Jeffrey Morosky, RLA, ASLA, CLARB is Managing Executive for The Landscape Architecture Studio at Walt Disney Imagineering. For the past 18 plus years, he has been leading the Landscape Architectural Studio responsible for Disney Theme Parks and Resorts worldwide, including retail, dining and entertainment districts. He holds a BS Landscape Architecture from Ohio State University. His role encompasses strategic development of professional landscape architectural talent, strategic studio initiatives, design tool applications for project implementation and resource allocation for area development projects. Mr. Morosky has 33 years of experience as a landscape architect for international and domestic residential, entertainment, resort and commercial projects of varying scale and complexity. 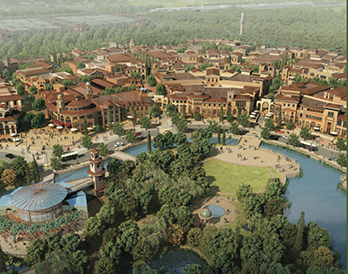 He is currently directing the landscape architectural design and development for Disney projects in Hong Kong, Mainland China and the Disneyland Resort. Relevant projects at Walt Disney Imagineering include: Downtown Disney, Anaheim California; Hong Kong Disneyland Governments Works; Promenade and Hotels, The Grand Floridian Hotel, Walt Disney World, Florida; Disney’s Aulani Resort and Spa, Oahu, Hawaii; Disney Explorers Lodge, Hong Kong SAR; Toy Story Hotel, Disneyland Hotel & Disneytown; RD&E Shanghai Disneyland, and numerous theme park and resort projects worldwide.